The post-1948 period saw the African National Congress (ANC) abandoning its traditional reliance on tactics of moderation such as petitions and deputations. In December 1949, with the support of the ANC Youth League, a new leadership came to power in the ANC. Walter Sisulu was elected secretary-general and a number of Youth Leaguers were elected to the national executive, including Oliver Tambo , Sisulu's successor. The period 1950 -1952 began with a commitment to militant African nationalism and mass action and to tactics of boycotts, strikes and civil disobedience. The period culminated in the Defiance Campaign, the largest scale non-violent resistance ever seen in South Africa and the first campaign pursued jointly by all racial groups under the leadership of the ANC and the South African Indian Congress (SAIC). D.F. Malan's National Party (NP) government followed up its unexpected election victory in 1948 with a massive social restructuring programme, which included the enactment of new apartheid laws, as well as the stricter application of existing discriminatory legislation such as the Pass laws and amendments to the Immorality Act. In 1951 the Separate Representation of Voters Bill to remove Coloureds from the common roll was enacted. The apartheid policy of the nationalist government was not simply a small-scale social rearrangement and an extension of administrative controls. It was in fact a process which sought to deny political representation and participation of Black people at all levels of government and which affected all sectors and all classes within the Black communities. It was this that provided a context for the mounting tide of popular democratic resistance to the apartheid state in the 1950s. On 6 April 1952 while white South Africans celebrated the tercentenary of Jan van Riebeeck's arrival at the Cape in 1652, the ANC and SAIC called on black South Africans to observe the day as a "A National Day of Pledge and Prayer". The majority of Black adults and school children boycotted many of the festivities. On that day mass rallies were held in Johannesburg, Pretoria, Port Elizabeth, Durban, East London and Cape Town as well as some rural areas. Dr. J.S. Moroka was the main speaker at the Johannesburg rally chaired by Dr. Dadoo. In Port Elizabeth Prof. Z.K Matthews spoke about militant African nationalism and self-reliance. He said, "only the African people themselves will ever rid themselves of political subjugation, economic exploitation and social degradation". I, the undersigned, Volunteer of the National Volunteer Corps, do hereby solemnly pledge and bind myself to serve my country and my people in accordance with the directives of the National Volunteer Corps and to participate fully and without reservations to the best of my ability in the Campaign for the Defiance of Unjust Laws. I shall obey the orders of my leader under whom I shall be placed and strictly abide by the rules and regulations of the National Volunteer Corps framed from time to time. It shall be my duty to keep myself physically, mentally and morally fit." The first group of volunteers including Nelson Mandela, Yusuf Dadoo, Moses Kotane, J.B. Marks, David Bopape and Walter Sisulu defied apartheid laws in Johannesburg and other major city centres. The defiers who began the campaign did so with a sense that history was being made. For the first time Africans and Indians, with a few whites and coloureds were engaging in joint political action under a common leadership. A national action committee, whose key members were Sisulu and Ismail 'Maulvi' Cachalia, and a national volunteer board, with Mandela as the volunteer-in-chief, conducted the campaign. Groups of volunteers went into action, small in numbers but high in spirits. During the campaign, acts of defiance were accompanied by freedom songs and the thumbs-up sign (introduced by the Cape ANC in 1949 as a sign of unity), cries of "Afrika!" and "Mayibuye!" and cheers from supporting onlookers. 52 Africans and Indians, including Walter Sisulu, Nelson Mandela and Ismail Cachalia, marched into Boksburg location near Johannesburg without permits. All were arrested. Mandela and Cachalia were present only as observers since they planned to avoid arrest. However, that evening they were among a group of protestors who were arrested in Johannesburg when they left a hall after curfew. In Port Elizabeth, 30 people entered a railway station through the "Europeans Only" entrance and were arrested. Others were arrested for entering the European sections of the post offices, sitting on benches marked for whites, or violating other apartheid regulations. Slowly the campaign spread, from Port Elizabeth and East London to smaller towns in the Eastern Cape Province, from Johannesburg to a number of centres on the Witwatersrand, to Cape Town, Bloemfontein and Durban. During the last few days of June, 146 volunteers were arrested; in July 1 504; during August 2015; and in September 2 058. The campaign gained momentum until October, but in November rioting erupted and the number of defiers began to fall. However, by mid-December an additional 2 334 were arrested bringing the total number to 8 057. Because offences were minor, the penalties were usually no more than short-term imprisonment with the options of fines not exceeding ten pounds. Sometimes defiers were acquitted, most notably in the case of 24 who entered a railway waiting room in Cape Town and were acquitted when the magistrate found that facilities for whites and non-whites were unequal. As the campaign continued, magistrates sometimes decided on whippings for defendants under the age of 21, and allegations of assault and ill-treatment in prison became more frequent. Although the offences and penalties were minor, the government still became concerned and reacted with the arrest of national leaders of the campaign in Johannesburg and the Eastern Cape. All were charged under the Suppression of Communism Act with promoting communism but were released on bail. Four years later, some of the accused were to be arrested on charges of high treason and tried under an indictment covering a period that began on 1 October 1952. 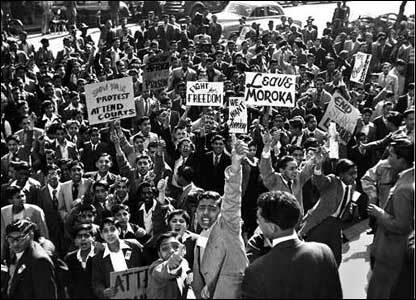 The trial of amongst others, Moroka, Sisulu, Marks, Mandela, Dadoo, Cachalia and Kathrada, began in November. On 2 December 1952, all 20 were found guilty of "statutory communism" and sentenced to nine month's imprisonment with hard labour, but this was suspended for two years. In Port Elizabeth 15 leaders were also found guilty and sentenced in 1953 for nine months, suspended for three years. Although the campaign did not achieve the desired aim of overturning the apartheid laws, it was successful in a number of other respects. The resistance won United Nations recognition that the South African racial policy was an international issue and a UN Commission was established to investigate the situation. During the campaign more than 8 000 people went to jail for defying apartheid laws and regulations and the ANC's membership rose by tens of thousands. These years were crucial as the Defiance Campaign saw the movement of the ANC from moderation to militancy. The campaign also demonstrated the potential power of African leadership and its organisational skill and discipline. This period marked the beginning of non-racial co-operation in the resistance to apartheid which would be furthered cemented by the formation of the Congress Alliance in 1954 in the run up to the Congress of the People.